How is it when you leave for a few days and then come back, all sorts of new developments seem to happen. Lee and I got back from a much-needed weekend away yesterday. We lugged all our stuff into the house and then we went out to check on the chickens. I watered them while they all slumbered away and they seemed fine. All the girls had been locked up in the coop for three days while we were gone and a neighbor collected their eggs for us. Today when I went outside to release them from the coop for the day, lo and behold, there was a dead Wyandotte under an empty chicken waterer. Lee now feels like a bad chicken owner. We again have no idea what happened. There is no way any animal could have gotten into the chicken coop and killed it. There were no marks on the chicken anyway. And why was the waterer empty when I just filled it the night before? Did I not screw the lid on right? We are scratching our heads over those two questions. So we are now down to 9 chickens. ARGG! I really, REALLY, hope nothing happens to any more of them. 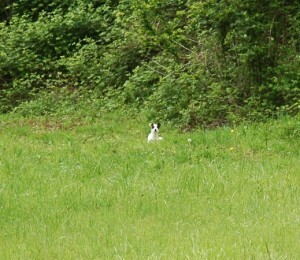 As Lee was burying the dead hen in our field we noticed a white dog sleeping out further in the pasture. Lee said that he saw a streak of white dog earlier that day when he was out. So now it appears we have acquired a stray dog. I can’t get close to it and have no idea what to do with it. If I see it around tomorrow then I will bring some food out to the field. I don’t want the dog to have a Jack snack because it is hungry. It’s been raining every day almost since we planted our tomatoes last week. We are hoping they don’t get some kind of mildew disease from this weather, because I don’t want to have to replace them all. I can’t believe that it is almost June and there’s is still a list of things we just can’t plant. The ground is too wet and the weather too cold. What has been growing in this weather is the slugs! Those slugs have been munching on my basil and other seedlings and I am not amused. With so much moisture around the D.E. doesn’t work especially fast. So I am considering what to use as a slug control. Lee is suggesting trying out a beer trap. This entry was posted in Gardening, Livestock. Bookmark the permalink. Sorry to hear about your hen. It sounds so strange! You will probably never know what happened, which is frustrating. Last fall, one of our Americauna hens just disappeared without a trace. We never saw her again, it was as though the Soviets sent her to the gulag! I feel your slug pain — we have a bad time with them, too. The DE is great in dry weather, but if it is wet the slugs just go to town. I use both DE and Sluggo, which lasts a bit longer in wet weather. It seems to work. Good Luck! We were gone once for 3 days, and my chickens went through a HUGE quantity of feed. I didn’t realize they would eat so much when confined, since they are usually out and about eating bugs all day. Bugs and grass will affect how much water they drink, too… when they are eating dry feed they will drink a LOT more water. In any case, you guys certainly aren’t bad chicken owners. Losses happen with chickens, sometimes preventable (in hindsight) and sometimes not. Since its too rainy for DE to work, you can sprinkle crushed egg shells around the plants that the slugs are bothering most. Not as effecient as DE, but works by the same method. If its raining a lot, you would have to change or add to the beer frequently to actually attract slugs… Good Luck! Ali- Oh dear, I wonder if the Soviets executed my chicken? 🙂 I have seen Sluggo in the store but haven’t tried it yet. Thanks for the recommendation. Jackie- We certainly have plenty of egg shells. Perhaps I’ll try that too. The guy at our local farm store said that the crushed oyster shell we bought as a chicken supplement could also be used against slugs. That is so awful that you guys lost another chicken! What’s going on here? It’s strange a swinging waterer could kill a chicken… But then, we had a chicken get a broken toe, and we think it happened on a metal chicken feeder. So strange things happen in the chicken world. Lynn, I guess we will never know. It’s frustrating though. I have a “hanging” feeder that we don’t hang and had to remove the handle. I had a R.I. red get her head stuck in it and I had a near miss as she struggled almost breaking her neck to try and free herself. The chickens will eat the slugs if you could only deliver them all!